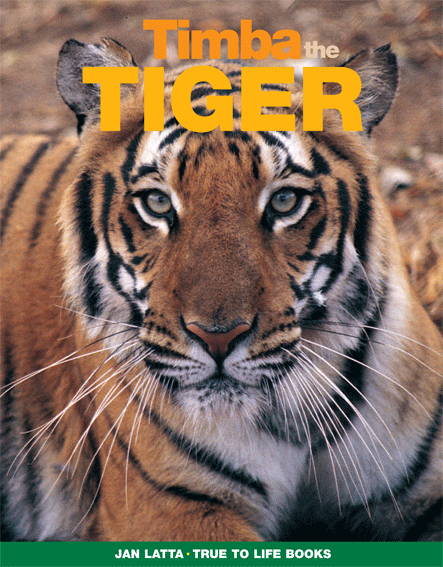 This was a very difficult book to create because I couldn’t find a tiger to photograph in the wild. I spent many months researching areas where tigers had been sighted in India, but when I arrived, there were no tigers to be seen. Then I went to Kipling Camp in the Kanha National Park. One morning my guide found fresh pug marks in the sand. We followed the footprints and a magnificent female tiger came out of the jungle. She was hunting for her small cubs who were hiding in the forest. It was so exciting to see a tiger in its natural habitat. Later I went to the north of India and rode an elephant every day. This was a great way to go into the jungle to photograph and write about tigers in the wild. The concept for the book is the tiger talking to children about its life in the wild and how it can survive. There are maps, interesting facts and fun activities. See this video of tigers in the wild.